By Admin on 4 February 2012 . THE Scottish people and media continue to impress us with their ability to say the word intersex and to pronounce intersex-including acronym LGBTI. That the people of Scotland and its media are not too frightened to say intersex and LGBTI and to cast them in print or pixels is an object lesson to the people and media of the rest of the United Kingdom as well as its government and lawmakers, especially those located in England. Scottish Lesbian, Gay, Bisexual, Transgender & Intersex (LGBTI) organisations have launched an appeal to Edinburgh’s Lord Provost, the Rt Hon George Grubb, to oppose discrimination against homosexuality. 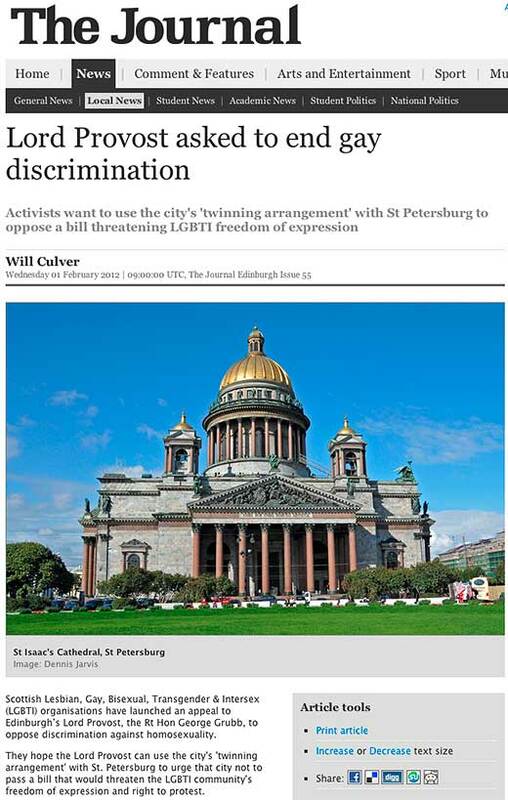 They hope the Lord Provost can use the city’s ‘twinning arrangement’ with St. Petersburg to urge that city not to pass a bill that would threaten the LGBTI community’s freedom of expression and right to protest. Refusing to say intersex or LGBTI actively contributes to the common, widespread silencing, exclusion and erasure of intersex people and actively supports the work of the medical eugenicists striving to disappear intersex from the face of the planet. Refusing to write intersex and LGBTI contributes to intersex genital mutilation – IGM – and the denial of human rights to intersex people everywhere.